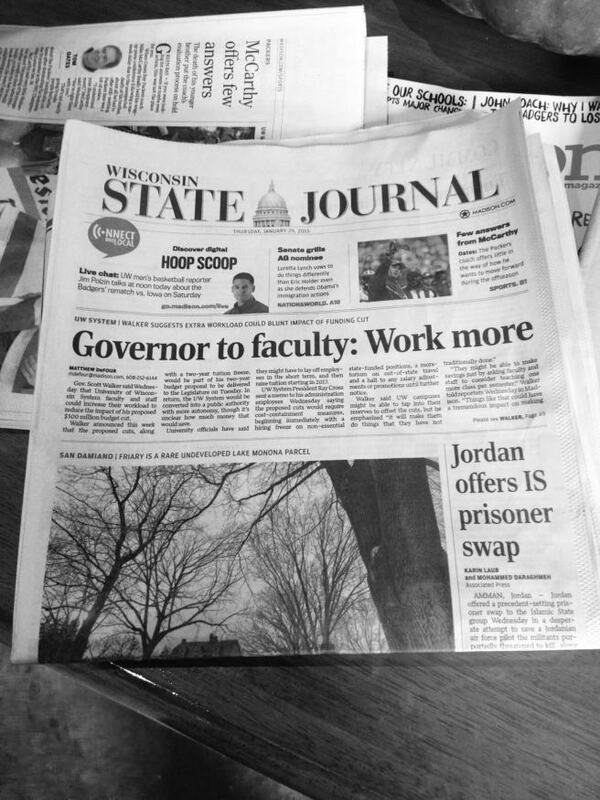 Last week, you told professors at the University of Wisconsin that they needed to “work harder.” You were making a case that the Wisconsin state budget crisis could be ameliorated by increasing employee efficiency, and you suggested having faculty teach at least one more class. I’m not going to talk about whether or not the budget crisis is manufactured (some have argued it could be solved by accepting federal funds for the state’s Badger Care health program), or whether your real goal is really partisan politics, and not fiscal responsibility. Ouch. Photo by fellow UW Madison geographer Sigrid Peterson. Instead, I want to talk about the myth of the lazy professor, a stereotype that you’ve reinforced with your comment. I spent 2005 to 2012 at the University of Wisconsin, where I obtained a PhD in the Department of Geography; I am now an assistant professor at the University of Maine.